9.30am-5.15pm. To be held in Otago Business School building Room 1.17. 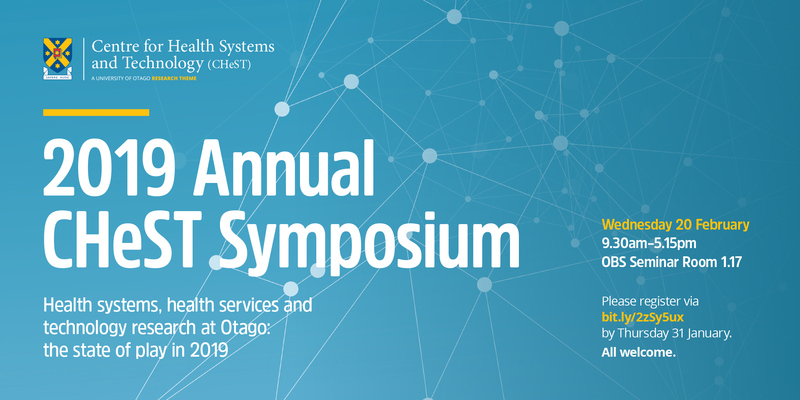 CHeST, which is a cross-campus University of Otago Research Theme, is hosting a one-day symposium aimed at highlighting key health systems, services and technology research and policy questions for 2019 and beyond. We warmly invite you to join us. Registrations are free and now open. Deadline for registration is by 31 January. To register for the FREE Symposium click here. The symposium will have a lively series of presentations from the University of Otago staff, District Health Boards and community-based organisations presenting on: primary health care, patient and community engagement, management and organisation, and funding. Please share this information with relevant networks and colleagues.